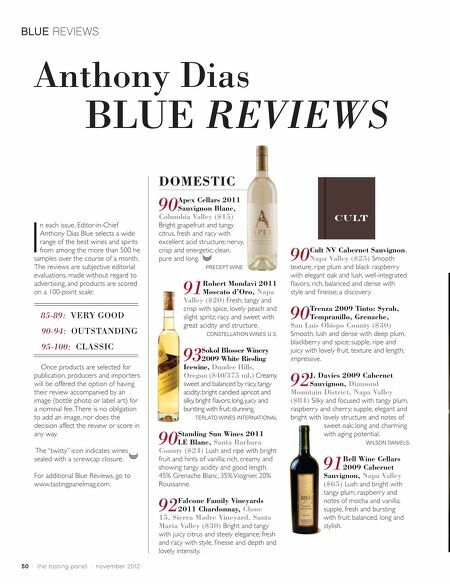 BLUE REVIEWS Anthony Dias BLUE REVIEWS DOMESTIC 90 I n each issue, Editor-in-Chief Anthony Dias Blue selects a wide range of the best wines and spirits from among the more than 500 he samples over the course of a month. 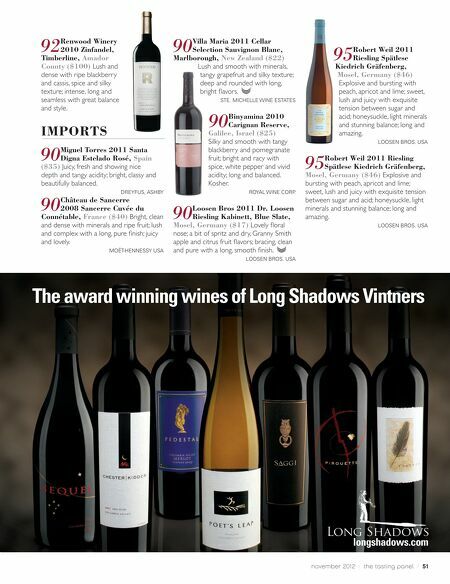 The reviews are subjective editorial evaluations, made without regard to advertising, and products are scored on a 100-point scale: 85-89: VERY GOOD 90-94: OUTSTANDING 95-100: CLASSIC Once products are selected for publication, producers and importers will be offered the option of having their review accompanied by an image (bottle photo or label art) for a nominal fee. There is no obligation to add an image, nor does the decision affect the review or score in any way. The "twisty" icon indicates wines sealed with a screwcap closure. For additional Blue Reviews, go to www.tastingpanelmag.com. Apex Cellars 2011 Sauvignon Blanc, Columbia Valley ($15) Bright grapefruit and tangy citrus, fresh and racy with excellent acid structure; nervy, crisp and energetic; clean, pure and long. PRECEPT WINE 91 93 90 92 50 / the tasting panel / november 2012 Robert Mondavi 2011 Moscato d'Oro, Napa Valley ($20) Fresh, tangy and crisp with spice, lovely peach and slight spritz; racy and sweet with great acidity and structure. CONSTELLATION WINES U.S. Sokol Blosser Winery 2009 White Riesling Icewine, Dundee Hills, Oregon ($40/375 ml.) Creamy, sweet and balanced by racy, tangy acidity; bright candied apricot and silky, bright fl avors; long, juicy and bursting with fruit; stunning. TERLATO WINES INTERNATIONAL Standing Sun Wines 2011 LE Blanc, Santa Barbara County ($24) Lush and ripe with bright fruit and hints of vanilla; rich, creamy and showing tangy acidity and good length. 45% Grenache Blanc, 35% Viognier, 20% Roussanne. Falcone Family Vineyards 2011 Chardonnay, Clone 15, Sierra Madre Vineyard, Santa Maria Valley ($30) Bright and tangy with juicy citrus and steely elegance; fresh and racy with style, fi nesse and depth and lovely intensity. 90 90 92 Cult NV Cabernet Sauvignon, Napa Valley ($25) Smooth texture, ripe plum and black raspberry with elegant oak and lush, well-integrated fl avors; rich, balanced and dense with style and fi nesse; a discovery. Trenza 2009 Tinto: Syrah, Tempranillo, Grenache, San Luis Obispo County ($30) Smooth, lush and dense with deep plum, blackberry and spice; supple, ripe and juicy with lovely fruit, texture and length; impressive. J. Davies 2009 Cabernet Sauvignon, Diamond Mountain District, Napa Valley ($84) Silky and focused with tangy plum, raspberry and cherry; supple, elegant and bright with lovely structure and notes of sweet oak; long and charming with aging potential. WILSON DANIELS 91 Bell Wine Cellars 2009 Cabernet Sauvignon, Napa Valley ($65) Lush and bright with tangy plum, raspberry and notes of mocha and vanilla; supple, fresh and bursting with fruit; balanced, long and stylish.